Tourism Missions: A V.I.P. 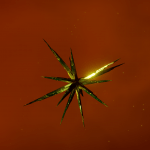 passenger Would like to visit one or more tourist beacons located within a few hundred light years from their starting point and return to it. This is an opportunity to discover interesting places from a historical point of view or with an exceptional panorama. It is a form of short-range exploration, giving a substantial amount of credits, while accounting for exploration rank. 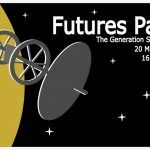 Long-range Exploration Missions: a V.I.P. passenger Would like to visit a tourist beacon located at a very large distance from its starting point, and return to it. These missions can either create an opportunity for a dedicated expedition or complete a route already planned. They lead to particularly spectacular or atypical systems in deep space. They give a large amount of credit (even if profitability is low in terms of time required), and account for the exploration rank. V.I.P. passenger Transport Missions: You have to carry a V.I.P. passenger from the starting station to another one. 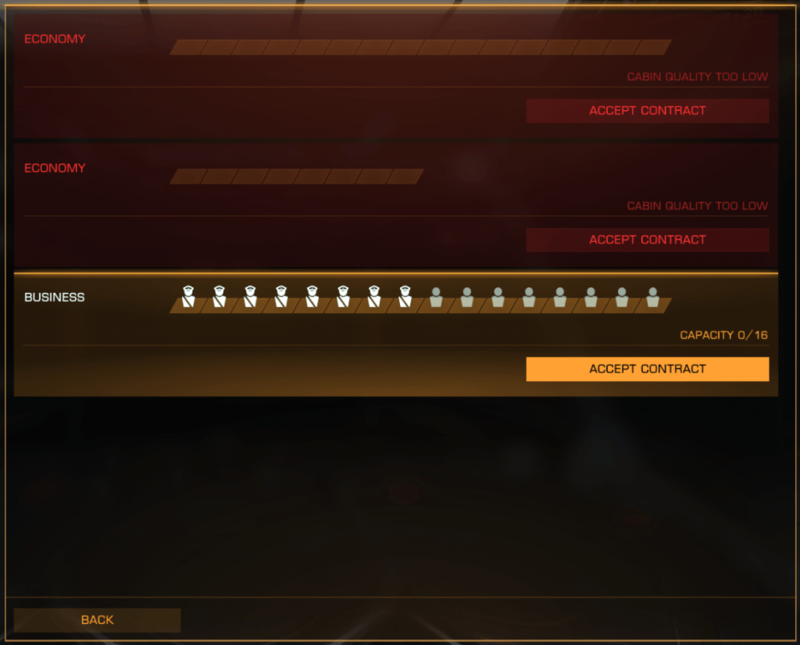 These missions have no connection with exploration, but can be very profitable if you realize several on the same journey, and account for trade rank. “Normal” Passenger transport Missions: a certain type of passenger (military, politicians,…) must be transported from the starting station to another one. 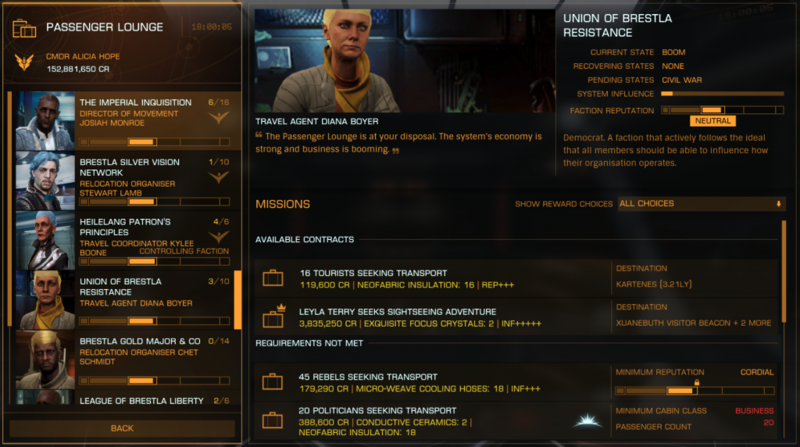 These missions have no connection with exploration, but can be profitable enough if you realize several on the same journey, and account for trade rank. 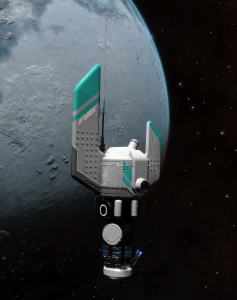 To be able to take a passenger mission it is essential to equip passenger cabins on its ship, available in the Outfitting menu. The higher the size of the module, the more seats are available. At equal module size, the higher you go to class (1. Economic, 2. Case, three. First class and finally 4. Luxury), the fewer seats available. 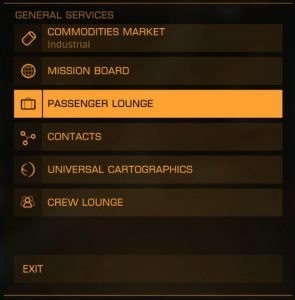 Passenger missions are available in the Passenger Lounge menu in the station’s services. When you click on a mission,the Mission Description screen opens, giving detailed information about it. Recommended rank. In the case of passenger missions this has no consequence on the difficulty of realization. However the higher the recommended rank, the more the mission is paid. The Decline button allows you to return to the list of missions without accepting. The Non-compatible cabins (class or number of seats) are red with the reason for the incompatibility. The valid ones are in white. The Accept Contract button allows you to accept the mission by selecting the cabin. The Back button is used to cancel the cabin selection and return to the Mission screen. In order to leave the maximum of options for other missions, it is advisable to always choose the valid cabin of minimum size and class. It is often useful to go around the table of missions to see the prices proposed according to the conditions, in order to choose the most interesting missions. To the wanted status of V.I.P. passengers. In this case the trait appears in red. These missions pay well, but you must avoid being scanned, at the risk of being attacked and destroyed by security. At the distance to the station from the main star, which can very strongly increase the time of completion of the mission. In the case of Long-Range Exploration Missions, at the distance to the arrival system, which can reach very large values, having a huge impact on the time of completion. In the case of Tourism Missions, the number of beacons to be scanned, considering the maximum time to complete the mission. Indeed, in the case of stacking many of these missions with a lot of beacons, the total time can become substantial (1 or 2 hours), while their maximum completion times are often quite short. It is particularly interesting to stack missions with the same destination (system and ideally station). In the case of Long-Eange Exploration Missions, for lack of the same destination, destinations that can be made on the same route can easily be carried out together. For the Tourism Missions, doing several missions at the same time generally reduces the travel time to go from one beacon to the next, because there is always a beacon available for each active mission, so you can make a circuit or always take the closest one. This also reduces the number of landings in the station to a single one at the end. There are two types of passengers possible: normal or V.I.P. In the case of normal passengers, all cabins of the same class are merged. 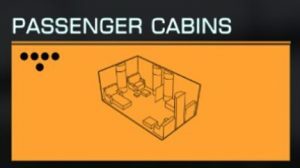 The same cabin can therefore be used for several missions, in combination with the other cabins of the same type. Normal passengers have a type (refugees, tourists, soldiers) which depends on the state of the system and the neighbouring systems. However this type has no impact on the accomplishment of the mission. This relates to the other three types of missions: Tourism Missions, Long-Range Exploration Missions and VIP Passenger Transport Missions. In the case of V.I.P. passengers, the main passenger and his friends occupy the entire cabin regardless of its total size. So we need a cabin per V.I.P. mission. V.I.P. passengers have a level of satisfaction that can decrease depending on what happens during the mission. If the level falls too low, the passengers eject or leave the vessel when landing at a station, resulting in the mission’s failure. V.I.P. 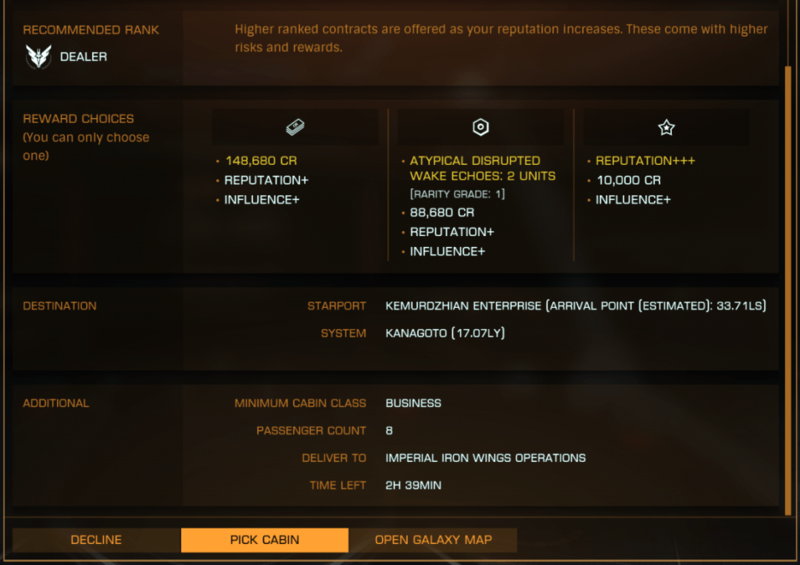 passengers have a type (celebrity, scientist, criminal), from which follows a set of passenger traits, listed in the mission Description screen. Each line induces more or less strong constraints for the realization of the mission. In case of acceptance of missions with the “demanding” trait, it is recommended to have a few tons of cargo space (5 to 10) in order to be able to store the goods requested. How to fit the ship? How many missions to accumulate? Should I take advantage of the point of view? Note that steps 2. and 5. can be very long as these missions send us to visit distant tourist beacons from 1 000 Ly to 30 000 Ly. Basically this is your exploration fit, plus one or more passenger cabins. The ideal is to adapt the equipped cabins to the needs of the missions you wish to achieve. How many missions to stack? Should I do exploration during the trip?